The firsthand and the inter-generational experience, is the key, without it there is no memory once that first generation is gone. Burt E Schuman, December 15, 2017, former Rabbi at Beit Warszawa in Warsaw, Poland. In translating and compiling the diary and the saga of the life of her mother Roma Talesiewicz Eibuszyc and her father, Abram Eibsuszyc, their daughter Suzanna Eibuszyc has produced a masterful epic, filled with memories of a close and loving family in pre-war Warsaw, the dislocations caused by two World Wars, her mother’s early commitment to the values of the anti-Leninist Yiddisher Arbeiter Bund and her profound sense of Polish patriotism and love of Polish literature and culture, despite the obligato of anti-Semitism which pervaded much of that country, despite the courage of Polish Righteous of the Nations. Her description of the bombing and surrender of Warsaw, the flight of Roma and her siblings to the Soviet Union and the desperate state of Russia during World War II under Stalin and the challenges her parents faced both in the town of Saratov and later in Uzbekistan had the qualities of an great epic novel. The experience of life in post-war Poland, the murderous pogroms and the ever-tightening vice grip of Stalinism made for a deeply moving account. Of their return to Poland and their departure in 1966. Jan Ledochowski, a 5 star review, March 5 2016. After the Second World War Jan’s parents could not return to Poland. His family were diplomats for the pre-communist government, now they were prime targets for repression. They had to emigrate to South Africa. Arthur Miller, May 1, 2016. As a Holocaust educator (non-historian), my eyes are constantly searching for new works of scholarship which shed new light and deeper understanding in areas of investigation already covered by pre-eminent scholars in their respective fields of expertise. For this reason I always find the genre of Holocaust memoirs especially meaningful and profoundly poignant. Grappling with the Holocaust on an intellectual level and grasping the Holocaust experience on a personal (“being there”) level are literally two different realties. I first discovered this work on a Holocaust FB page that piqued my interest. It rarely happens that a book so moves me that I feel an overwhelming and irresistible need to contact the author and have any lingering uncertainties clarified and explained. Such was certainly the case with this haunting memoir and sensitive author. The author’s mother read Hitler’s “Mein Kampf” in Polish translation as a young girl in pre-war Warsaw and when the shocking German invasion occurred on that fateful day, she instinctively went into auto pilot by escaping to the East. . . and further East and further East. . . It seems nearly every day was a struggle for survival and a piece of bread. While the various ethnic groups were fighting and betraying each other, it seems everyone was hunting for Jews. For me personally, reading this memoir was a harrowing and anguishing experience that I will forever be extremely grateful to both the author’s traumatized mother — for painfully and painstakingly unearthing her traumatic memories and committing them to paper towards the end of her life, and to the author herself — for courageously finding the inner strength to fulfill her commitment and promise to her beloved mother to preserve the non-ending nightmare in print for all the world to see. In between everything, Ellie Wiesel was a kindly guiding figure who encouraged Suzanna Eibuszyc with eternal words of inspiration: “The story must be told. Silence is never an option.” Now I am here to tell you: “This story must be read”. Chuck Fishman, Photographer. 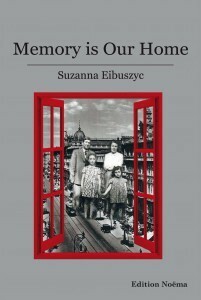 A memoir based on her mother’s diaries, Suzanna Eibuszyc’s “Memory is Our Home” is a fascinating book, especially for those interested in life as a Polish Jew in the 20th Century. Suzanna’s mother, Roma, grew up in Poland during the interwar years, barely survived the Holocaust in the Soviet Union and Uzbekistan and returned to a devastated country to find friends and family gone…murdered. She started a family in then a communist anti-Semitic Poland and was finally able and willing to leave the country with her daughter’s in the 1960s. “Memory is Our Home” is an illuminating view of survival, perseverance, family, history and much more. Suzanna interweaves her own recollections both growing up in communist Poland and raising her two daughters in the United States making this a “living document” narrated by two generations. Suzanna’s father died in 1961 and was buried in the Jewish cemetery in the town of Klodzko in southwest Poland. In 2008 Suzanna brought her daughters to visit the country of her youth which included a trip to the Klodzko cemetery for the girls to see the grave of their grandfather. It, and the other monuments there, were broken in pieces, destroyed by hateful ignorant people. This 1975 photograph of an arranged pile of broken tombstones (matzevot) in the remains of the Jewish cemetery in Siedlce is also in southwest Poland not far from where Suzanna’s father is buried. It was the last picture in my book “Polish Jews: The Final Chapter” (1977, out –of-print). With the renewal and re—identity of Jewish life and culture in Poland today, that title has been proven somewhat premature. When I read of Suzanna’s cemetery experience with her daughters, I thought of this picture. “NIOD covers the 20th and 21st century, with a focus on research into the effects of wars, the Holocaust and other genocides on individuals and society.” I met Maria Van Beurden Cahn at the 27th annual World Conference of Jewish Child Survivors of the Holocaust in Houston TX. My book, Memory is Our Home is accessible at NIOD. Dr. Rita Vinocur, Memory is Our Home by Suzanna Eibuszyc is an outstanding book which is a powerful tool for students and public in general. It has a place of honor in our Shoah Library in Montevideo Uruguay and I highly recommend reading it. The Shoah Library in Uruguay called Simon Wiesenthal, means that hundreds of people will be able to read the lesson of memory of the Shoah which your books gives. Thank you again G’s bless you and remember if one day you come to Uruguay to visit our Library and Shoah Museum, we’ll receive you with open arms. Liladhar R. Pendse, Librarian for Central Asian, East European and Slavic Studies. Doe Library, University of California, Berkeley, Your book has been added to our collections on Shoah materials from Poland. To be honest, when I read your dedicatory inscription, it made me very sad and emotional. Yes, this crime cannot be forgotten. Thank you for sharing your parent’s (mother’s) memories with us. Eric Scott, Les Productions des Quatre Jeudis Inc., I just finished your book this afternoon! Trust me, I’ve read a lot of Polish Holocaust memoirs since I began this bizarre journey towards making a film Polish restitution. Your book is a powerful one, among the better ones I’ve read. And the story sucked me in. Completely. I liked how you separated your voice from your mother’s, yet you connected them. David Rico, NY, It’s been a long time since I’ve enjoyed reading anything as much as I did your book. I’ve always been interested in history and especially history surrounding the Second World War. Roma really came alive to me. The way she dealt with and persevered through so many bad experiences is truly inspiring. Thank you for sharing her story. Judy Weissenberg Cohen, editor Women and the Holocaust, I highly recommend: I was involved with Suzanna at the very beginning of her trying to bring to light her mother’s life story. Now, rightfully so, she published it in a book form. Read the distinguished scholarly and other voices praising the immensely unique historical value of this manuscript wanting to become a book. The entire web site is worth exploring. Thanks for listening. Svetlana Grinberg, NY, I’ve just finished reading your book. It is wonderful! It’s heartbreaking, it’s educational, smart and powerful. I could not stop till I turned over the last page. I’ve read a lot of books about Holocaust, watched a lot of movies, but I don’t remember beefing so deeply touched. May be because you feel that every word in this book is true, may be because my parents have gone through almost the same pass as yours: from Kiev, that was bombed at the first day of war, to Uzbekistan, my husband’s family – to Siberia. They experienced almost the same hardships, probably it has been a little easier for them than for your family because they were born Soviet citizens. The difference was that my parents hardly spoke about those times. I believe they tried to protect us children from the terrible truth. I just picked up some pieces about Holocaust much later in life. The Soviet policy was to conceal and forget. Also this book is so close to me because I was raised and had lived for almost 50 years in Lvov that is mentioned many times in your book. It is really a beautiful city 700 year old, magnificent architecture. i used to love it, studied its architecture, knew every historical building, churches. There were not many Poles left there after the war, they left for Poland, and whoever stayed were very humble. Our family even had a housekeeper – a Polish woman, very skillful, hard working. Our family was rather well off, my father was a professor, my mother – a doctor. And soviets appreciate scientists much more than other professions. I don’t remember ever experience a hunger that your mother described in such vivid and horrifying words. Also as strange as it seems, in my childhood and youth I’ve never experienced antisemitism, although I’ve never concealed that I was Jewish, and my last name spoke for itself – Grinberg. Only when I started to work, and was trying to find another job I realized that it was the government policy to restrict Jews from better paying jobs. I got to the state university probably because my father was a known scientist. But when we realized what kind of a government we had, when we found out what happened there during the war, how Ukrainians and Poles participated in exterminating the Jews we decided that our daughter, her future children can’t live there. As soon as we got a chance we emigrated and never looked back, and never would return and even visit this place that we would love for so many years. Linda Marie Marsh, 5 of 5 stars review on Goodreads, Nov 19 2015. An incredibly unique memoir of life during the holocaust and after, and the effects that trickle down through time. The author got her mother to write what she would not speak about, write about her life before during and after the horrors of Hitler and his henchmen. The bulk of the book is set in Poland and Russia which gave it a unique aspect. The first generation of survivors lived in constant fear and silence, constantly looking over their shoulders long after the war ended. Their children absorbed it all and learned to grow up with tremendous distrust! And so it goes…generation after generation…. Laura, Asheville, NC, posted on Goodreads May 01, 2015, I have to admit I was a little skeptical about this novel. I ended up gaining knowledge in the stories which were told. For some reason reading this feels more like storytelling then a novel, it’s told in a way that is more intimate then many narratives which I have read. Laura Burstein, Los Angeles, Ca, posted on Goodreads Apr 12, 15, Memory is our home is an extremely captivating memoir which was translated by Roma’s daughter, Suzanna from Polish to English after her mother passed away. The chapters are interspersed with comments by Suzanna of her impressions during that time period growing up in Poland. I couldn’t put this book down. Roma Eibuszyc tells us her story, no holds barred. She takes us from her childhood in Warsaw, Poland, to her life after escaping the brutal Nazi regime to Russia and then Uzbekistan. I could feel Roma’s emotional struggles after she leaves her entire close knit family at the start of the war and dreams of uniting with her family after the war. Roma faces obstacles that would daunt most of us. She inspires with her perseverance. Her focus on the task at hand is a lesson to be taken to heart. This book is well worth reading. It is important that we never forget how the tragedy of the Holocaust affects many generations to come. The voices of first generation and second generation Holocaust survivors are interwoven in this family remembrance covering pre-war life in Poland, escape from the Nazis to the Soviet Union and its eastern Republics; a return to Poland after the war, and finally immigration to the United States and adjustment to a new life. Author Eibuszyc, who is the second-generation voice, found her mother’s memoir, translated it into English, and combined it with her own reflections on what it was like growing up under the influence of her parents’ memories of their World War II suffering. In doing so, she provided some juxtapositions that might otherwise have escaped the reader’s notice. The cost, for some readers, at least initially, was confusion as to which family member is narrating. I would have preferred a straight chronological account, going from the mother’s story to that of Ms. Eibuszyc. However, writers have their differences, and my approach is not necessarily more valid than that of Eibuszyc. More important than the style of presentation is the substance of presentation, and on this score, I was very impressed. Although Eibuszyc’s mother wrote matter-of-factly about her experiences, I don’t think that I will ever be able to say the words, “I’m hungry” again, without accusing myself of chutzpah immediately thereafter Eibuszyc calls her memoir Memory is Our Home. Inside that “home,” people were near starvation. After being exiled to a village in the endless stretch of the Soviet Union, it became clear that while the Soviets didn’t murder their prisoners in assembly-line fashion as did the Nazis, death at the Soviets’ hands was all too common. To get out of the freezing cold, one must have a shelter. To obtain a shelter, one must get a job from the state. But these jobs paid starvation wages. People were always hungry. The less scrupulous stole food or money from other people. The more scrupulous tried to supplement their incomes by buying goods in one locale and selling them in the other. In the United States, we call admire the latter approach as private enterprise. In the Soviet Union, it was known as criminal black marketeering. Steal it or buy and sell it, you were considered an economic criminal. So, often people had to endure long periods — we’re talking days at a time — with very little or no food at all. That was frequently the situation of Eibuszyc’s mother, the former Roma Talasowicz. If people were fired from their jobs for even a minor infraction, they could lose their homes. In one instance, Eibuszyc’s mother had no place other than a shed in which to huddle with others during severe weather. Riya Wollack, Carlsbad, CA This deeply moving and historically important project. The Breman Jewish Heritage & Holocaust Museum, Atlanta GA.
International Child Survivors/Hidden Children of the Holocaust Warsaw, Poland, August 2011, published a chapter from Memory is My Home in their commemorative book TO REMEMBER AND TO HONOR. This is a great tribute to my mother; she never forgot her city of Warsaw, although after the war the communist government did not allow her to return to the city of her birth.